Milford on Sea, often hyphenated as Milford-on-Sea, is a large village and civil parish located on the south coast of England in Hampshire. With a population of 4,660 (2011 census), it has a variety of shops, restaurants, cafes and pubs in its high street, which borders the village green, pebble beaches and a hospital. Milford on Sea is a village on the shore of Poole Bay in Hampshire. The village is scenic in location, protected from development by a surrounding green belt of land. From the beach, the Needles of the Isle of Wight are on most days clearly visible. On the coast to the west on a clear night, the conurbation of Christchurch, Bournemouth and Poole can clearly be seen, together with the stars reflecting on the sea. Slightly further east is Keyhaven, with its boatyard and bird sanctuary. Protruding southwards from Keyhaven is Hurst Spit, approximately two miles of shingle, from the end of which the inhabitants of Hurst Castle used to watch over the Solent. The castle was built by Henry VIII, and is now visitor oriented, with a museum, lighthouse and café. A seasonal ferry makes the trip across the marshes roughly every 20-30mins as an alternative to the blustery walk across the shingle. Milford began as a Saxon settlement, and the name simply means "mill ford". At the time of the Domesday Book of 1086 there were two separate estates in Milford, one held by Aelfric Small, and the other some unpopulated land held by Wulfgar. At a later date three separate manors were evolved from these estates and were eventually known by the names of Milford Montagu, Milford Barnes, and Milford Baddesley. The manor of Milford Montagu, which was held of the lords of Christchurch, seems to have originated in an estate held by William Spileman at his death in 1291. In the late 14th century it was part of the lands of William Montagu, 2nd Earl of Salisbury. In 1428 Thomas, the 4th Earl, died possessed of the manor, and was succeeded by his daughter Alice. By 1580 the manor had passed out of the hands of the Montagu family, and it was acquired in 1610 by Sir Thomas Gorges, who was succeeded by his son Sir Edward, Baron Gorges of Dundalk. In 1638 he sold it to Edward Hopgood. At the end of the 18th century the manor was purchased by Admiral William Cornwallis. The manor of Milford Barnes originally belonged to Christchurch Priory. After the Dissolution a twenty-one years' lease of "the site of the manor with the appurtenances and all land and fisheries belonging, together with 20 acres in Shorefield," was in 1557 granted to John Wavell, and in 1574 a similar lease was granted to John Rowe. Sir Thomas Gorges owned the estate in 1611, and from that time its descent was the same as that of the manor of Milford Montagu. The manor of Milford Baddesley originated in an estate held in Milford by the Knights Templar. In the time of King John, Hugh de Whitwell and his son William granted land at Milford to William Mackerel which he granted to the Templars, for their preceptory of Baddesley. It was held of Christchurch manor. On the suppression of the order of Knights Templar this estate was granted, about 1312 to the Knights Hospitaller, to whom it continued to belong until the Dissolution of 1540. It was acquired by Robert Rickman around 1609, in whose family it remained into the 18th century. In 1829 Mary Anna Theresa Whitby, who had inherited Admiral Cornwallis' estates purchased Milford Baddesley, thus uniting all three estates. Around 1800 Admiral William Cornwallis leased and later purchased the small Newlands estate in Milford. His purchases included the manors of Milford Montague and Milford Barnes. He was joined at Newlands by his close friend and fellow naval officer Captain John Whitby and John's wife Mary Anna Theresa Whitby. John Whitby died in 1806, but Mary and her infant daughter Theresa stayed on looking after Cornwallis into his old age. On William Cornwallis' death in 1819, Mary Whitby and her daughter inherited his fortune. In 1829 Mary Whitby purchased Milford Baddesley, thus uniting all the estates in the area. Her daughter Theresa, who inherited the estates, married Frederick Richard West, and they used Newlands as one of their residences. Their son, born in 1835, bore the name of William Cornwallis-West. He inherited Newlands in 1886, and attempted to convert Milford into a premier seaside resort, changing the name of the village to Milford-on-Sea. His plans included the construction of a pier, railway station, public baths, health spa, and golf course. The scheme failed primarily due to a lack of funds and market interest, but it gave Milford a layout and ordered development that lasted well into the 20th century. William's son George Cornwallis-West inherited Newlands in 1917 and sold it three years later. As recently as 1800 the parish of Milford was entirely inland, being separated from the sea by a narrow strip of coast-line which was an extension eastwards of Hordle parish. Coastal erosion, as well as the growth of the village to the south and west, meant that by 1900 Milford bordered the sea. Milford was part of a combined Milford and Pennington Parish Council after 1894, and then became a separate Milford Parish Council when Pennington was separated from it in 1911. 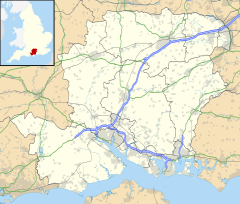 However, in 1932 Milford was absorbed into an enlarged Lymington Borough, only re-emerging as a separate parish in 1974. With the advent of increasing car ownership, especially after the Second World War, the village expanded rapidly as a resort and as a place in which to retire. Blocks of flats were constructed along the clifftop in the 1960s and '70s, and additional housing was built inland. The oldest building in Milford is All Saints' Church which is 12th/13th century in date. The earliest parts of the structure are probably Norman (early 12th century) work from a preceding church. A south aisle was added around 1170. In the 13th century the church was more than trebled in size and brought to its present plan. This work, which occurred in stages, included the north facade and tower, the chancel, and north and south chapels. The tower has a later, short recessed spire. An electoral ward in the name of Milford exists. At the 2011 Census the population of this ward was 4,838. Every year, Milford has the May Day festival on the village green with the traditional Maypole dancing, this includes two young girls from the local school being crowned May Queen and May Attendant. In late June through to early July there is also the Music and Arts festival. It runs for about three days with local bands and drama from local schools, as well as stalls and craft workshops; It is perhaps, the most memorable event in Milford. In August, there is the Milford Carnival with a voluntary parade with floats and the procession of the Carnival Queen. In February 2009, the Milford on Sea Food Week was launched to take place from Easter Bank Holiday Monday until the following Sunday in 2010. Milford on Sea Food Week is a community event celebrating all that is great about food. During Food Week, the village will host dining events, celebrity shows, cookery experiences & demonstrations, educational events & talks, competitions & a local food market. There are events for every age group & are run by various local businesses, clubs & organisations. The Food Week is organised by local volunteers. Milford on Sea Food Week is now an annual event in the village calendar. This plan is a wide-ranging statement of community ambitions, based on sound research and extensive public consultation. It aims to retain the best of Milford-on-Sea, to improve many of our facilities, and to ensure the vibrancy of the village. It builds on the 2002 Village Design Statement which dealt essentially with land use issues. Improving the provision of social, cultural and recreational facilities. Enhancing and protecting the natural environment. Maintaining and developing parish facilities for tourism and business opportunities. Improving transport links with hinterland communities. Making the village centre safer for pedestrians whilst protecting its special character. Christopher Airay, logician, was vicar here in the 17th century, from about 1646. William Morris, 1st Viscount Nuffield, philanthropist and industrialist, owned a house on the clifftop, 1 Park Lane, which is now a hotel. David Peach (Gillingham, Southampton (FA Cup Final 1976), Swindon Town, Orient and England u/23 footballer). Frances Fisher, Hollywood actress who has appeared in films such as Titanic, was born in the village. Frank Wootton, famous aviation artist, was born in the village. ^ "QS102EW Population density for Milford on Sea". www.ons.gov.uk. Retrieved 21 March 2015. ^ "Milford, Old Hampshire Gazetteer". ^ "Domesday Map – Milford". Archived from the original on 2 November 2014. ^ a b c d e f g h i j "Historical faces from Milford on Sea". ^ a b "Hampshire Treasures, Volume 5 (New Forest), Page 229 – Milford on Sea". ^ "Hampshire Treasures, Volume 5 (New Forest), Page 167 – Lymington and Pennington". Archived from the original on 18 September 2011. ^ a b c d "Hampshire Treasures, Volume 5 (New Forest), Page 234 – Milford on Sea". ^ "Ward population 2011". Retrieved 20 October 2015. ^ "GENUKI – Westmorland – Clifton". Wikimedia Commons has media related to Milford on Sea. This page was last edited on 13 December 2018, at 16:52 (UTC).